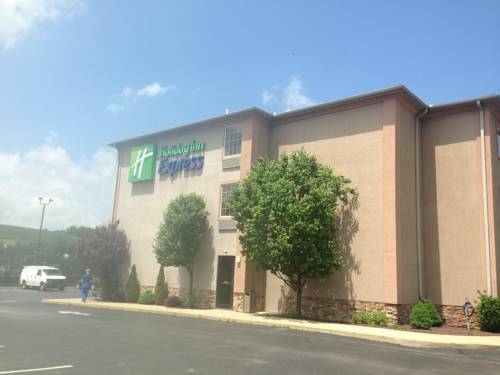 If you're looking for lodging in the Laurel Highlands, look no further than Holiday Inn Express Mt. Pleasant-Scottdale. Whether on business or leisure, we are conveniently located near many business' and attractions in the New Stanton, Greensburg, Connellsville, and Uniontown areas. Come enjoy this beautiful, four season location while checking out Frank Lloyd Wright's Falling water and Kentuck Knob. Or checkout one of the wonderful nearby state parks, wineries, or amusement parks.We're also just a short drive away from Hot Shots Arena, the West Overton Museums, and many major companies. Take advantage of our numerous amenities, including our meeting room, business center, and fitness center to keep productive during your visit. And be sure to start your morning off right with our complimentary Express Start breakfast bar , which includes standard breakfast staples along with hot foods, gluten-free options, and our signature cinnamon rolls. Come and meet our friendly, courteous staff who are waiting to make your stay amazing! All Mexican cuisine with all the works. You will enjoy how the employees treat you like family and their food is out of this world! If you're looking for something familiar, Applebee's is conveniently located in the plaza above us. Its close proximity makes it a great choice after a long day of travel. Comfortable room for meetings from 8 to 60 people. Children's program - Traveling with kids? Visit Hot Shots! Located just minutes away from the Holiday Inn Express, the young and the young at heart will enjoy this video arcade and indoor ice hockey rink. Or the YMCA located seconds from Hot Shots. Norvelt Golf Club is a 27 hole golf course that is open to the public. Ask at the front desk and our staff will be happy to call the club house and reserve a tee time for you. A stony-faced pioneer Mom, in long skirt and bonnet, struts westward with an infant in her arms. ~25 miles from Mount Pleasant. ~33 miles from Mount Pleasant.